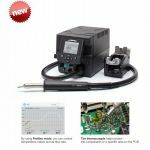 The NEW JBC Tools JTSE Series high powered hot air stations to repair all types of SMD quickly and safely, even the biggest QFPs and PLCCs. The JBC Tools JTSE Series Hot Air Stations features two work modes -manual or profile- to manage efficiently the temperature and the hot air flow. 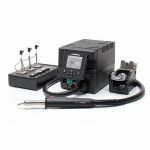 Using the menu in the JBC Tools JTSE Series Hot Air Stations, you can personalize over 20 parameters to help manage the soldering process. Choose between the JTSE-1A and the JTSE-1QA Hot Air Stations to fit your Hot Air Needs. Choose a JBC Tools JTSE Series Hot Air Station Today.